Secret Invasion was the big deal Marvel event of 2008. The Skrulls, intergalactic shapeshifters with attitudes (and long time Fantastic Four foes), are just about fed up with Earth (again) and are pulling out all the stops this time. It’s kind of an Avengers centric event, at least in that there are not as many Mutants involved this time around. Lots of the plot revolves around who is actually a Skrull, when they were, what they did, you know: drama drama drama. Sweet! I didn’t read it at the time (you know I usually read trades) and it seems that debate is still raging on the best reading order for the issues. I’ve pulled together this list from the original checklist, several forum threads, blog posts, my own feelings about recommended material and chronology, and some stupendous guesswork since I still haven’t read many of the crossover issues. Like the other orders, we’ll revise as needed according to discussion. I’m especially interested in anything else that might be essential for history and backstory plus better placement for the supplementary material. In addition, now that the Marvel TPB list is up, you’ll be able to see a nicely sorted trade list for this event at this link. 44. Secret Invasion: Who Do You Trust? 10. 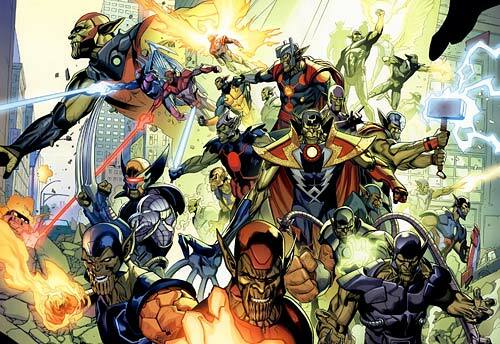 Secret Invasion: What If? And that’s all I’ve got for now! So what do you think? It’s a big one. I’ll be reading through in this order and doing more double checking eventually (it’s not high on my to do list at this moment), but if you notice anything weird, don’t hesitate to add your opinion! Thanks dude. This was a big help. I was just going to read the Nova, Guardians of the Galaxy and Inhumans issues, but ended up reading the She-Hulk and X-Factor tie-ins (big Super-Skrull fan) and the main series. Your order worked perfectly. GOTG can really be read anywhere since it all takes place on Knowhere. Inhumans can kinda go anywhere but really works best like you’ve got it. Nova, She-Hulk and X-Factor need to be in order. I read She-Hulk separately while I was reading through her run and it seemed to make ok sense on its own at least, though I probably spoiled some of the story for myself. Glad to hear it’s working out. Thanks for the feedback! On the supplementary, should we hold on reading that till the end, read it first, or it doesn’t really matter? Specifically I am having trouble placing the Skrulls v. PowerPack issues. Thanks so very much, What is # 37 though? Haven’t read marvel for many years and want to start up on a few of the big events. Just got myself the infinity gauntlet and secret wars and I want to continue on with Secret Invasion and then move on to the War of Kings and eventually the Thanos imperative i think. However I am having trouble with figuring out what to get my hands on with the secret invasion, this is a nice huge list. I wonder though, have they published any collected editions ? I prefer huge books or paperbacks to seperate comic issues. I notice you have The Mighty Avengers #19 listed at #74 and The Mighty Avengers #18 listed at #77. Is this right or is this a typo? Incredible Hercules 116 needs to be included. Its 1 of 6 “Sacred Invasion.” Can really go from Infiltration to right before Herc 117. I’d suggest right before Herc 117, you get the series in order. Excellent list – I’ve been catching up on Marvel the past few weeks with Marvel Unlimited (great service for any Marvel fan – 9.99 a month an virtually everything in the past ten years is on there). Thanks! for great information I was looking for this info for my mission. a fresh spin on a subject that’s been written about for years. Thanks for the list. As for the Captain Marvel comics, are tou referring to the Carol Danvers caprain Marvel series or 2002 series? The lost is great btw!! !